At home, in the car, or anywhere else this Hand-Crank Emergency Radio is a necessary addition to any emergency kit, while at the same time being dynamic enough for general use. Powered by a Rechargeable Ni-MH battery pack (via the hand-crank), 2 AA 1.5V batteries, or a 4.5V AC/DC adapter (not included) it will have lasting power when you need it the most. 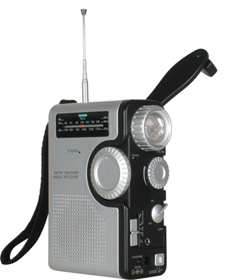 The radio supports FM, AM and Weather Band frequencies, and has a headphone jack for personal listening. The Tri-LED light source will be sure to keep you out of the dark as it consists of three large super bright LEDs. A socket for charging mobile phones can also be found on the radio. Supported cell phones are: Sony/Ericsson, Nokia, Samsung, and Motorola. Included with the radio are the necessary conversion plugs for these cell phones. One-minute of cranking ensures 2-hours of flashlight power, 25 minutes of radio play time, and 80-minutes of mobile phone stand-by.